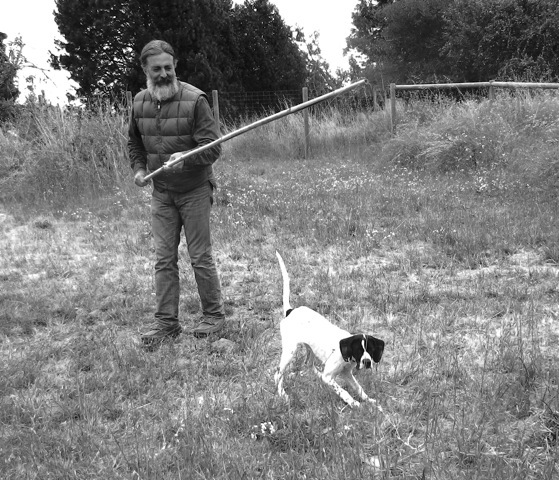 Daniel, with his new Civil War beard, trains one of his astonishingly beautiful pointers, art married to genes… look at that tail! Earlier in the month, I volunteered to help the Colorado State University field school when they conducted an excavation at a nearby site here in Douglas County. It’s common for archaeology field schools to take their students to archaeological sites other than the one they are working on to broaden their exposure to other site types and materials. Another volunteer and I who are familiar with local archaeology helped by taking the students to some local sites after their work day was done. 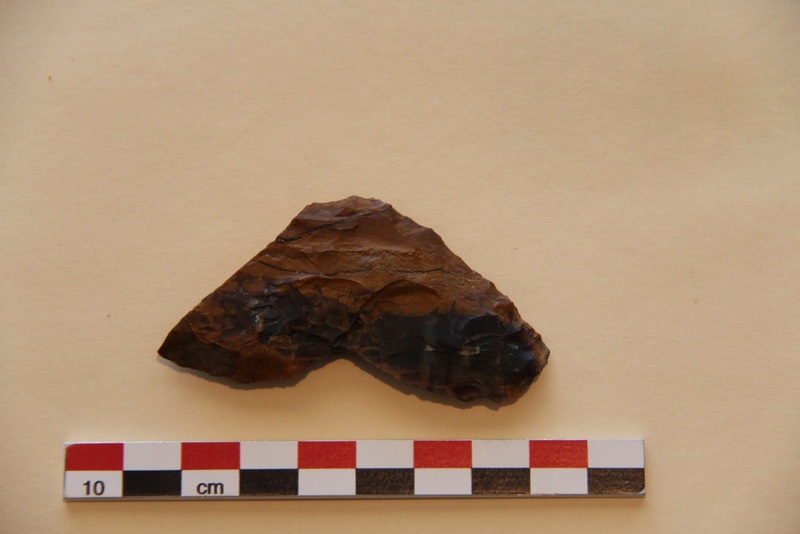 On one of these visits to a site located on County Open Space lands, one of the students saw what she identified as an odd-looking biface on the site surface (see picture). Having previously worked in the Great Basin and California I was able to identify this as a Paleoindian crescent tool, an artifact rarely found here in Colorado. These date to about 8 – 12,000 BP and here is a short article about them. Here is a picture of a crescent we found on one of my projects in the Mojave Desert in California about ten years ago. The current theory is that most of these were actually used as projectile points on atlatl darts. They were mounted transversely with the concave end oriented as the “tip” of the point. It is believed that these were used for hunting water fowl. In the late Pleistocene, the Great Basin and California were covered with many large permanent lakes (Great Salt Lake is a shrunken remnant of one of these) that would have teemed with millions of ducks, geese and swans. Research has shown that these crescents are usually found near the shores of these extinct Pleistocene lakes (the one we pictured above from California certainly was) and excavated sites containing them have significant quantities of water fowl bone. If you are interested in learning more about this artifact type and its likely role in the peopling of the Americas, I recommend you watch this YouTube video of a lecture given by Dr. Jon Erlandson of the University of Oregon a few years ago. If you watch, stay on through the Q & A period at the end which contains lots of information. 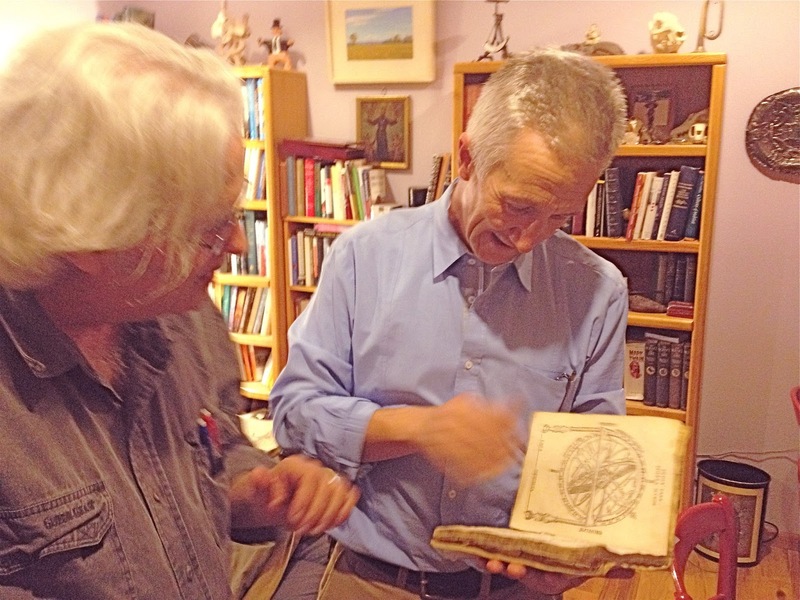 If you really want to dig in, you can go here and buy a copy of a comprehensive article on them by Dr. Madonna Moss and Erlandson published in the Journal of World Prehistory in 2013. As I alluded to earlier, these are extremely rare in Colorado, where we didn’t have those large Pleistocene lakes. The Moss and Erlandson article contains a distribution map that shows two in our state and one each in Wyoming and New Mexico. Asking around to knowledgeable people, I have been able to find a picture of one from a private collection in northeastern Colorado. 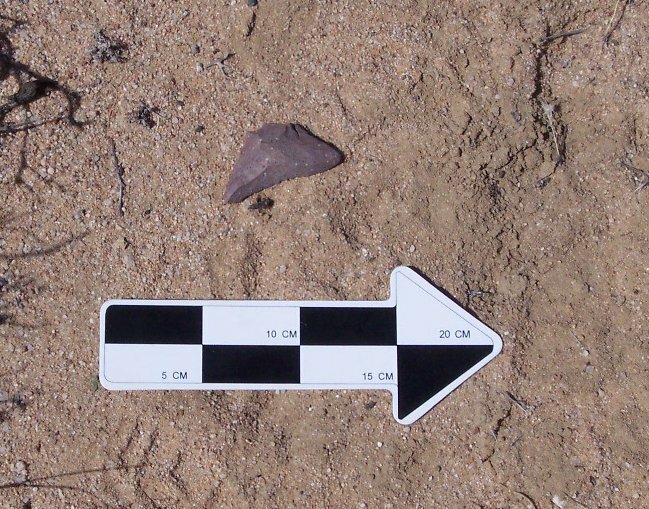 We certainly would have had water fowl here, but not in the huge numbers that would have merited devoting a large number of distinctive projectile points to hunting them. The site this one was found on is located near a confluence of two major creeks, but not near any lake. I am also intrigued by the fact that this crescent is made of a locally sourced petrified wood. It was locally made, and not some exotic object traded in from elsewhere. Did the person who made this travel to the Great Basin where he found out about crescents and come back to make one? Or migrate from the Great Basin to here, perhaps? Interesting to speculate. 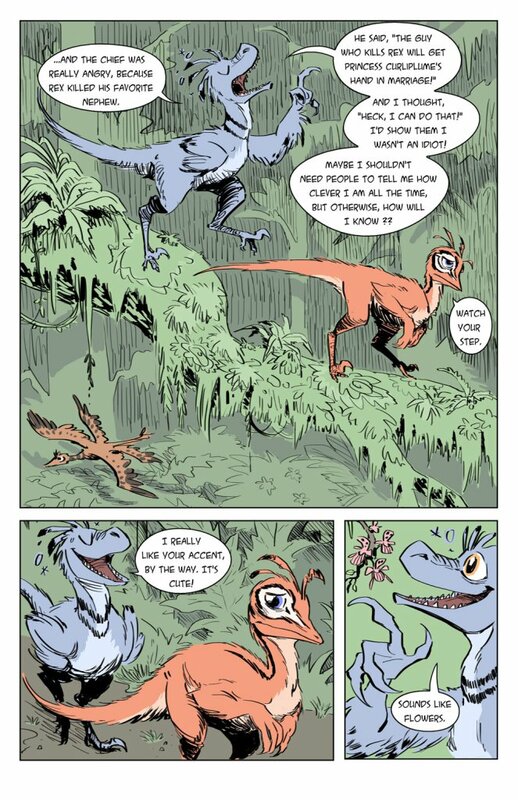 Moro Rogers has a delightful new serial webcomic, featuring the adventures of a (properly feathered) “Raptor”*. * Mark Witton will explain why “Raptor” is a dumb common term for Dromaeosaurs. Not Moro’s fault– she knows Dinos– just pop culture’s. And to end the week with something more than the exploits of idiots. Both from the same shop at the Beeb, the one that gave you Goshawks flying in slow motion through holes in a wall; the first via Lucas Machias. I have seen the second and it goes well here. Another essential dispatch from Jon Katz at Bedlam Farm. of them from New York, some from elsewhere) to people for days in a row. Hollywood stars who think they are being hip and progressive. off to languish or die.. The carriage trade is considering lawsuit. I would not be optimistic about this but for a strangely parallel suit won by environmentally conscious ranchers against the so- called Center for Biodiversity (do NOT confuse with the scholarly Berry Center for Biodiversity at U Wy Laramie, run by my friend Carlos Martinez del Rio– I mean the one down here run by the former grad student in literature from Long Island, the one that seems to harass good ranchers as though it were a personal feud). A rancher named Jim Chilton has a 25,000 acre lease in Arizona where his environmental practices have been praised by a team of independent researchers who studied the land for six years, among others. 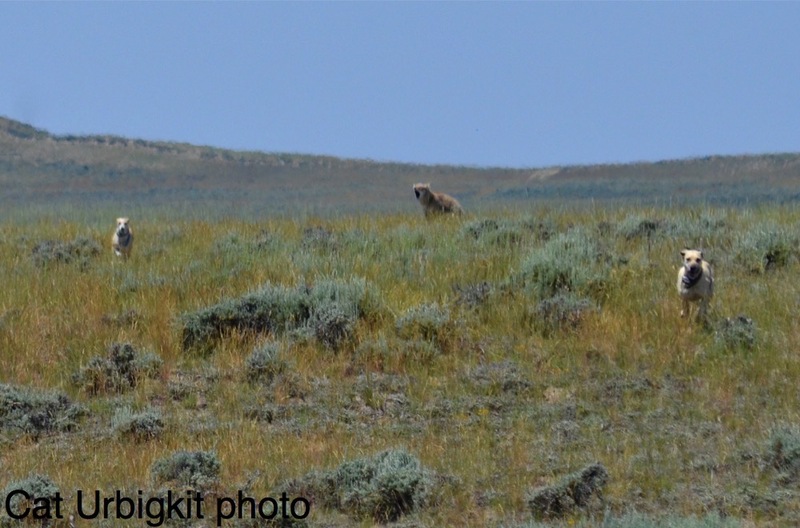 We parked the truck under the crest of the ridge and the two yellow female curs jumped from the cab to the ground, sniffing around unconcernedly for ground squirrels. Jeff quietly called the dogs back to the truck so he could snap electronic collars onto their necks. The girls remained quiet and seemed calm, but as I glanced at the seven-year old female, I could see the muscles of her back legs quivering in excitement. Although the collars can send electric shocks, for these seasoned pros, that would not be necessary. Instead, Jeff would use the collars to emit electronic beeps to communicate commands. There would be no voice commands in the field. 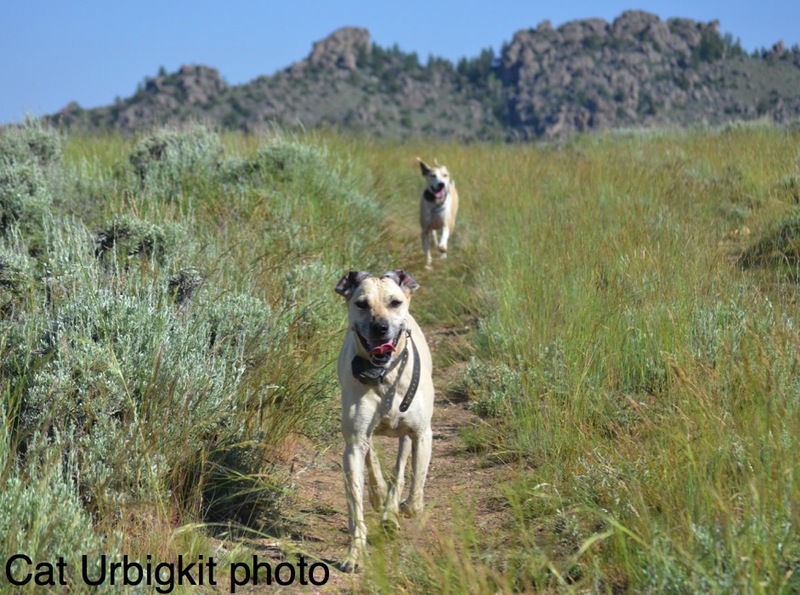 We spoke little, walking quietly with the dogs until we’d reached a rock outcrop perched at the end of the ridge overlooking a small pond, with sweeping views up several drainages along the face of the Wind River Mountains. We sat with our backs against the rocks, the dogs sitting patiently in front, as Jeff blew on a coyote call. We sat still, mosquitoes buzzing around us, sweat dripping down our backs, while the dogs slowly moved their heads from side to side as they scanned the hillsides for movement, occasionally adjusting their rumps for a more comfortable position. 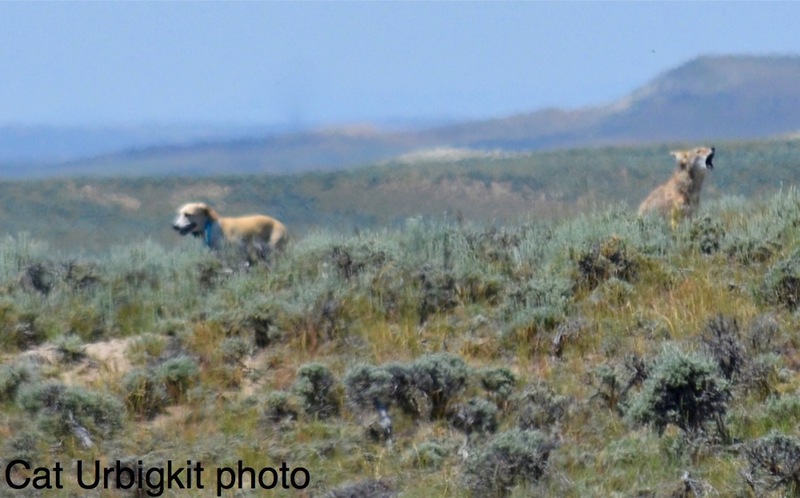 Plenty of birds, butterflies, and a few pronghorn antelope, but no coyotes, so we gathered ourselves back up for a hike to the next ridge, headed to check a location where a female coyote had denned the year prior. The morning was long past and it was 80 degrees by the time we reached the rugged bluffs above the Big Sandy River, checking on one last den site before calling it a day. I could hear lambs calling to their mothers from the riverbed below as we began hiking toward the den, the curs trotting out in front of us. 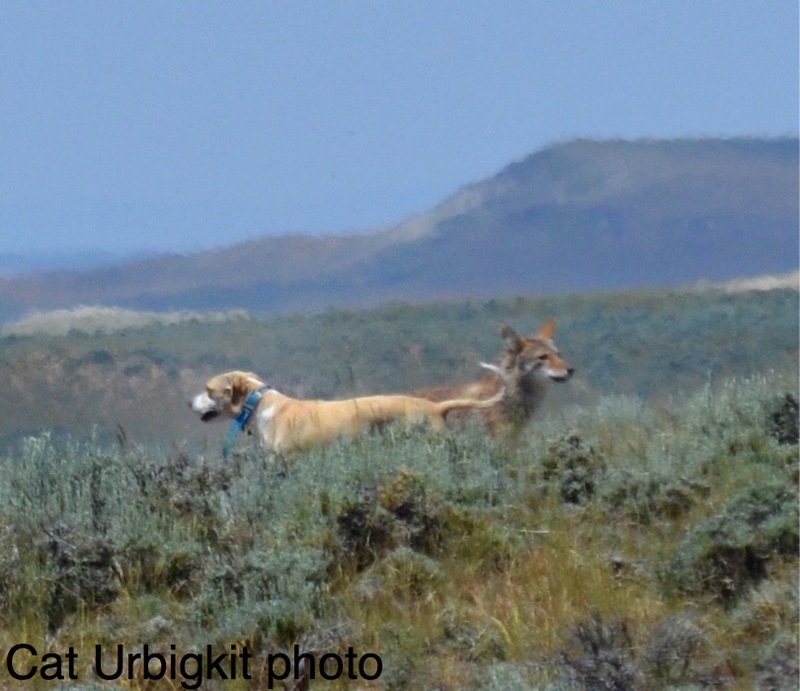 It was far too hot for anything to be happening, but the curs quickly jumped an adult male coyote that had been lounging on a ridgeline away from the pups. 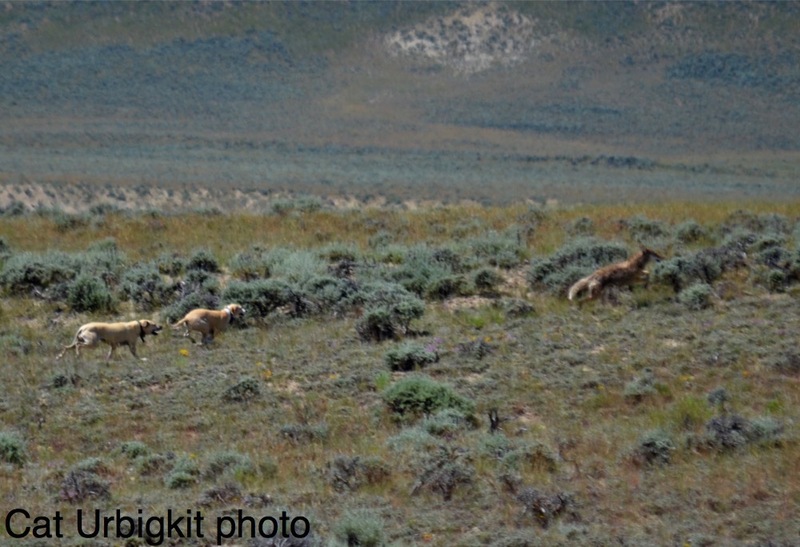 One yelp from the dogs and the chase was on, away from us and out of sight over the ridge. Within seconds I saw a dog’s head pop up on the skyline, as one of the dogs took a look to locate her human partners. A few barks and yelps later, the two curs came charging back over the top of the ridge, with the male coyote a few paces behind. The coyote was agitated at the intrusion into his range, barking aggressively, and trying to get close enough to grab a mouthful of dog. But the curs were fast and determined, swinging back around and coming to a full stop to urge the coyote forward when he faltered. The temptation was too much, and the coyote again gave chase. The girls brought him in at a run directly across a small draw from our location, where Jeff was waiting with his .22-250 Remington. The dogs slowed and stopped, as did the coyote, giving Jeff a clean and close view. One quick shot and the coyote was down. 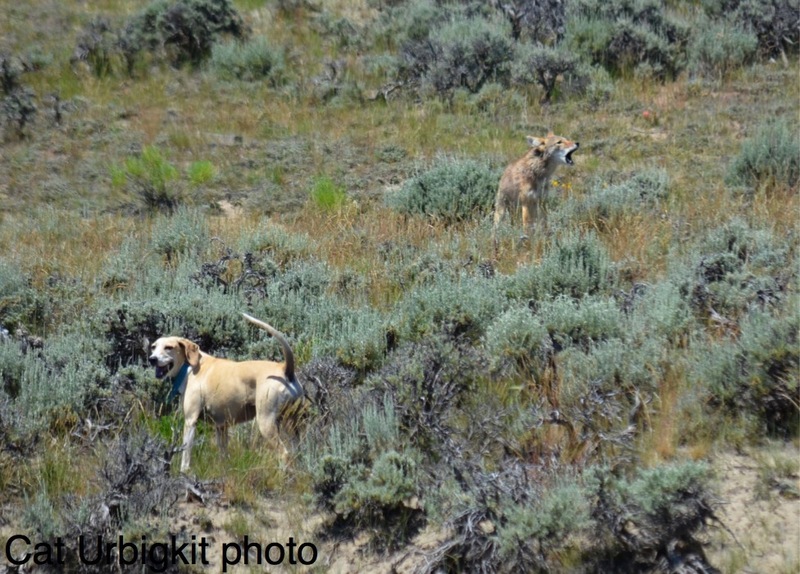 The dogs raced back to us for praise, then returned to rough up the carcass a little before leading us back along the ridgeline. After a quick water break, the dogs escaped the heat by climbing back into the cab for a well-deserved nap. Best Product Description: “Icelandic Beer Made From Smoked Whale Testicles”. Really. What would you do if a a wolverine dug you out of a snowbank? A rescue wolverine? Who says sea eagles are slow? Lazy maybe, never slow. Alaska falconers must watch out when flying their Gyrs on the coast, where Bald eagles dominate the air. Watch this one’s effortless gain on the poor Osprey. This is the best video of the Lyrebird EVER; best birdsong, funniest bird video in years, name it. I have been reading an excellent and important book from Australia by Tim Low, on Australia as a point of origin for many of the world’s bird families, and went looking for David Attenborough’s video of the bird. It is good, but this is epic. Turn up that sound!